Summary: Raw cacao nibs or raw cocoa nibs (some even call them "chocolate nibs") are absolutely, amazingly delicious, and extremely good for you. Whether you prefer to call them cacao nibs, cocoa nibs, or chocolate nibs, the bottom line is that they are chocolate at its most pure. Raw cacao nibs (or raw cocoa nibs) are absolutely, amazingly delicious. Whether you prefer to call them cacao nibs or cocoa nibs, the bottom line is that they are chocolate at its most pure. And they are so good for you! In any event, raw cacao nibs (or cocoa nibs) are an absolute treat. Crunchy, chocolatey, and not at all bitter like baking chocolate (although not sweet either – they are just perfect!) they can be eaten plain, mixed into recipes, sprinkled over fruit or ice cream, or just eaten with nuts and dried fruits by the handful! You can mix them into pretty much any sweet (or indeed some savory!) recipes. Leave them ‘whole’ for some crunch, or mix them in with other ingredients in your food processor or Vitamix to grind them up. They are wonderful added in to smoothies and nut-based drinks, and divine mixed into homemade ice creams. For a great drink, try our Orange Chocolate Dream! Or our Banana Split in a Glass! And my own Mole Mole sauce uses them! One site recommends cutting up squares of raw honeycomb, sprinkling them with the cacao nibs, and serving. Yum! 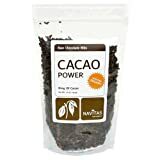 Raw cacao nibs can be ordered many places online, including Amazon! Check out the video about cacao and David Wolfe called “Cacao Boy” which is a parody of “Cowboy” by Kid Rock. I offer several video recipes using cacao on YouTube. Please search for my channel. Thanks!